Warren Buffett discuss about importance of investing in only good businesses. Discussion based on his own investment decisions and the valuable Lesson he learned. - Interview with Becky Quick, CNBC. I have been looking for opportunities based on corporate actions and this one seems to be worth mentioning. Murudeshwar Ceramics Ltd rights issue offer. Normally, the price is expected to fall to account for the new shares, but looking at the history and my earlier experience with rights issue, that's not the case always. So if the current price maintains after the new shares are allocated, the profit potential of is ~50%. And since the potential is high, it offers a buffer in case price falls. There is no guarantee that price will remain at Rs. 40/- level (or even near that level). Based on IndexoMeter, I have been converting from securities to liquid assets and currently hold around 25% in cash and this might provide an opportunity to deploy some of the cash for a short period. I am planning to invest in this opportunity. Will keep you posted on how it works out. Bonus ratio: 1:1 & Split: Rs 5 to Rs 2. This was an interesting experiment and I am glad that the investments generated decent positive returns. But I don't think I will do it again. I am currently looking into some other opportunities which seems to have better prospects. Will post the details once I have more information. Its been a while since I posted any messages.. Work, School & Family are keeping me really busy!! Since the start of this year, I have not made many transactions in my portfolio. But something about Parsvnath Developers (company was part of my portfolio) caught my attention. The company promoters are currently holding 63.60% shares of the company and promoter 'bodies corporate' are holding 11.11% as per latest (June, 2010) update. And promoters and promoter companies have pledged 77% & 98.46% of their respective holdings in the company. In other words, majority of the shares of the company are now pledged!!! Could be because of many reasons including promoters in financial trouble and gambling with the company. I didn't think it was a responsible action from promoters, so sold all my shares in the company. Again, the pledge could be because of many reason but I didn't want to find out the reason and future results with my money!! Why do I admire Warren Buffet? Lot of people recognize or use Warren Buffet's name, majority knows him as one of the wealthiest man alive. I thought i will add why I personally admire him. To start, it's not because he is one of the wealthiest man in world, there are plently of other super wealthy whom I don't admire or I don't care. In case of Warren Buffet, it adds credibility and shows that what he does works (really well)!! - His records are proven over a long period of time (50+ years) and not a one time 'lucky' phonomemon. - His principles are simple to understand (didnt say easy to follow :-) ). You don't have to be a genius to understand it. - He is open in sharing his investment principles and what worked for him. There is no secret trading platform or investment armies with complex trading algorithms. - Does not prefer loosing sleep (risk) for few extra $$. - Very modest salary of $100,000 for a corporation with its size and profit. And unlike Wall Street CEOs who earns 1$ salary and multi millions in stock option and other benifits, he does not have a stock options. - He treats his shareholders are partners, and candidly discuss his objectives and why he does certain things in certain ways. His shareholder's handbook is a great read. - His way of managing his companies (80+) is different. He Identifies/acquires talent/companies and give them freedom to do what they are good at and continue to grow business. Does not interfere in day to day activities of his CEOs. Does praise his managers indivudiually, openly often in his meetings and letters.So, most of the owners/CEOs continue to work for him after Bershire buys the business from them. - Allocates capital the most efficient ways. - Manages Risk better than pretty much anybody!! Read last year's shareholder letter where he states that risk management is CEO's responsibility and not that of a Risk Manager's or that of a committee's job. - He does not claim that he knows the future in short term. Unlike many others, who claims that they can predict S&P accurately for next week and month, he says he CAN'T predict future in short term. - Lives a modest life inspite and extreme wealth and success. - Donated most of his wealth to charity. That too, he didnt set up a new charity in his name, instead found the best available (Bill Gates) and allocated his wealth to their charity. - He made his wealth by investing in capital markets, which is an area of interest to me. Above all, I personally find that his principles makes sense to me and that is something I can follow. And it worked for me in past and continue to works for me!!! Inspite of all these, I am not saying he is perfect and not human!! I recently purchased 3 books after taking inputs from couple of people and looking through the list of best books listed by the investors I follow. 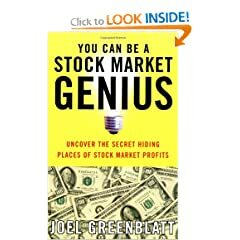 Title: You Can Be a Stock Market Genius - Uncover the secret hiding places of stock market profits. Now, don't be misled by the title. It is in fact a good book. It's not a 'hot' book which just came out now, it was published first edition on 1999. This is not a book for everyone; it is focused on different types of corporate actions and opportunities for profits arising due to it. In the book, author goes over multiple topics were market can be inefficient (at least for short durations). It covers topics including Spin-offs, Mergers, Restructurings, Bankruptcies, Rights Offerings, Risk Arbitrage, Merger Securities, Recapitalizations. Good think about it is that the author provided one or more case studies (from his own experience) along with discussion of each type of opportunities. Also a pretty comprehensive list of resources where we can look for new opportunities and how to pursue are given in last chapter. As the author says multiple times on the book, this book servers as a guide and makes the readers aware that these types of opportunities exists, so the read have an idea about what to look for. It's a light read, no formulas or complex equations. All the case studies discussed (one case come close to a blowup, but ended well) in the book are success, it would have be interesting read about few cases where it was disaster (because it happens!!). My second post related to Buffet, this one looked interesting. During height if panic, Lehman team approached Buffet requesting investment in their company. Buffet asked Lehman's management team to invest in Lehman along side with him (or should I say, asked to eat their own cooking?). Lehman CEO Richard Fuld called Buffett on March 28, 2008 to discuss the possibility of Buffett "investing at least $2 billion in Lehman." "Two items immediately concerned Buffett during his (March 28) conversation with Fuld." First, "Buffett took it as a negative that Fuld suggested that Lehman executives were not willing to participate in a significant way" by investing in the firm under the same term. Second, Buffett thought Fuld's complaints about short sellers indicated a "failure to admit one's own problems." Complete news and actual report from court-appointed Lehman bankruptcy examiner Mr. Anton Valukas is available here. Individual year's performance is available in the annual report. Following chart shows Berkshire Hathaway performance along with S&P 500 from Year 1965 to 2009. Following chart shows Berkshire's relative performance compared to S&P 500. E.g, in 1965, Berkshire gained 23.8% while S&P gained 10%, which gives the relative performance of +13.8% for Berkshire. Charlie and I avoid businesses whose futures we can’t evaluate, no matter how exciting their products may be. We tend to let our many subsidiaries operate on their own, without our supervising and monitoring them to any degree. We make no attempt to woo Wall Street. Investors who buy and sell based upon media or analyst commentary are not for us. Instead we want partners who join us at Berkshire because they wish to make a long-term investment in a business they themselves understand and because it’s one that follows policies with which they concur. Berkshire has around 80 fully owned companies and its broadly classified into four. Portfolio contains 13 companies with more than 1$ market value. All well known companies including Amex, P&G, Coca-Cola, Wal-Mart, Wells Fargo etc. Total investment portfolio market value is currently $59 Billion. And a $26.0 B position on non-traded securities including Dow Chemical, GE, Goldman Sachs, Swiss Re & Wrigley added for a total cost of $21.1 B. On Stock-for-stock offer: In evaluating a stock-for-stock offer, shareholders of the target company quite understandably focus on the market price of the acquirer’s shares that are to be given them. But they also expect the transaction to deliver them the intrinsic value of their own shares – the ones they are giving up. If shares of a prospective acquirer are selling below their intrinsic value, it’s impossible for that buyer to make a sensible deal in an all-stock deal. You simply can’t exchange an undervalued stock for a fully-valued one without hurting your shareholders. "Don't ask a barber whether you need a haircut" - referring to use of investment bankers to evaluate an acquisition. "I subtly indicated that I was older and wiser, I was just older" referring to manager's reservation on GEICO's failed credit card offering idea. Our pre-tax losses from credit-card operations came to about $6.3 million before I finally woke up. We then sold our $98 million portfolio of troubled receivables for 55¢ on the dollar, losing an additional $44 million. GEICO’s managers, it should be emphasized, were never enthusiastic about my idea. They warned me that instead of getting the cream of GEICO’s customers we would get the – – – – – well, let’s call it the non-cream. I subtly indicated that I was older and wiser. I was just older. Details of next annual meeting are also provided. It was interesting to read this section, since I already attended earlier shareholder's meeting. Program structure is pretty much same, with few minor changes. The OWNER-RELATED BUSINESS PRINCIPLES section on pages 89 - 94 is a must read!! A few percentage points can make that kind of difference?? :-) One noticeable similarity between these two funds and Berkshire is that they all have very low turn over ratio. I have to also add that comparing Berkshire to mutual funds is not exactly fair, since mutual funds managers have restrictions on what they can invest in and have mostly a short team focus to please investors. While as a majority owner in his Berkshire, Buffet does not face those pressures, also he is a proponent of shareholders acting as long term owners. I just completed my Spreadsheet based Modeling (Linear Programming) course by Prof. Amit Basu, and it was interesting enough for me to try using Berkshire's performance data. Here I am not using any models, but using some of the tools available to interpret the data. I have uploaded it here. A critical part of investment decision is asset allocation, how you allocate the asset across different asset classes. It plays an extremely important role in your chances of succeeding in long term. In other words, it provides the the flexibility to act when market offers good opportunities to buy or sell investments. If one had a significant % of his portfolio allocated in liquid assets including cash during the last crash, he would have had an opportunity to reallocate the portfolio to stock and other riskier asset at very attractive prices and there by higher the chance of appreciation of portfolio as a whole. Same way, if you had moved from riskier asset to safe assets before the crash, once would have saved lot of heart burn. On the other side, if you have significant % of your portfolio allocated in safe asset when market goes up, it limits your chances of gain. In other words, a good asset allocation is as important as picking the right stocks. Having all right stocks and a wrong asset allocation does not do much good. As a side note, Buffet went into recession with $40+B in cash. He utilized significant portion of it in investments like Goldman Sachs, Wrigley, Burlington Northern along with other investments over last 2 years. This cash position was definitely an advantage for Buffet and he utilized the cash position during downfall to his advantage. Another reason for Buffet''s general high cash holding is Berkshire's huge insurance operations. Having a right asset allocation strategy is easier said than done. I am trying to improve in this area, and still looking at many options, one of the things I am trying is to develop an asset allocation correlated to index P/E (aka. Indexometer). While not a fool proof method, what it means is to allocate more towards liquid assets as the index PE goes up and move towards more riskier assets when P/E is low. Again, this is not an automated process or a rule, but more of a guide (among other things) for asset allocation. Also, I don't plan to sell all of my stocks as index PE goes up, rather try to adjust exposure accordingly. I must add that the strategy helped in the recent fall (at least, to till this moment). I had high cash component going into last month's fall compared to previous times. One time is not enough to call it a rule, but planning to track it closely to see if it really works over time. In order to add more visibility to the process, as a Beta (trial) version, I am adding a new chart (on page top, click on the link "[+-] Asset Allocation Chart") which displays the percentage of liquid asset in my total portfolio at a given time. In the graph, this % is compared to corresponding index PE along with index and fund performance. So, over time I am hoping to see a positive corelation between cash/liquid asset and index PE (As index pe goes up, cash component in portfolio also should go up, and vice versa)). I am still working on the best way to display it, but going to start it to see how it works out. If you have any suggestions about how to display this information in a better way, please let me know. My objective is to display the allocation of liquid asset in the portfolio and compare it to index. Note: I have scaled the index and fund numbers proportionately to cash position range, so that graph looks more meaningful. In this particular graph, I am not comparing the performance of the index or my fund (we already have a graph for it). Key elements in the graph are the cash and liquid asset % (which is approximately 100% - stocks allocation). 50 questions in the Risk Intelligence Test, the importance is on self knowledge. Risk Intelligence Quotient (RQ) is a measure of a person's ability to estimate probabilities accurately. People with high risk intelligence tend to make better predictions than those with low RQ. This test is rather unusual in that you can score very highly even if you don’t know much. That’s because this test measures self-knowledge rather than factual knowledge. It rewards you for gauging your own level of uncertainty accurately, rather than for knowing a bunch of facts. Projection Point is a private, independent, non-profitmaking project set up by Dylan Evans and Benjamin Jakobus with their own money to satisfy their own curiosity. This is a different post compared to our normal topics discussed here. Video is from www.ted.com (Thank you Paul Varghese for forwarding this video!! ), Shaffi Mather (Social Entrepreneur) is discussing about his latest venture focusing on fighting corruption. A Look at Friedman & Keynes Theories Post Crisis. Writer John Cassidy talks with Kai Ryssdal about the article he wrote for The New Yorker. Wish you all a Very Happy New Year!! - Welcome 2010!! Sensex started the year 2009 at 9,647 and my fund at 59.1, during the course of year after a wild ride, Sensex closed the year at 17,464 and fund at 148.27. In one word - "Great Year". In terms of percentage (Sensex: 81% & Fund: 150.8%), fund beat the index by around 70% difference. But again, I consider this year to be lucky year & expect almost everyone's portfolio to be up substantially last year. My portfolio calculations are based on the total performance of all different assets - Stocks, Cash, Preferred stocks, Corporate FDs, Mutual Funds. So it provides a complete picture of the assets which are allocated for investments rather than one asset like stocks. I think this is the only way to measure the performance and check if it justifies your time, effort & risk. If we just take high risk/rewards asset alone like stocks, I think the numbers would be higher. I have written in detail how I calculate and track my portfolio here. Its easy to do and takes only 5 mins at weekend, best of all, I did not have to do anything special at year end to see how it worked out over last year and every step of the way!! I made couple of changes over the year and planning to go over few of those changes briefly below. Allocated a percentage of portfolio (not hard allocation) for arbitrage/corporate action based opportunities and it worked out very well last year. One such investment was TRF when it announced 1:1 bonus shares issue. Sold the shares at 55% profit in 4-5 months (took longer than I expected to sell) which translate to around 132% annualized profits. Another one was Adlabs (now Reliance MediaWorld/Works), brought shares of Adlabs and sold Reliance World (Radio-BigFM) bonus shares received for handsome profit (still holding Reliance Media shares). I sold very minor portion of 'Jindal Steel and Power Ltd.' shares for the first time after I started accumulating it in 2004 (6 years ago). It had a great run and the only reason for the decision to offload a little was because this single stock was growing more than 40% of my total stock portfolio. So currently I am selling it as and when it go over 40% of total stock portfolio. JISP is planning for Jindal Power IPO early next year, that may be an opportunity for next year, waiting to see the details of the issue. Over next year, I may reduce my total % of investment in JSPL even further. Reduced the number of companies in the portfolio to 15, this may vary in future, but it was always my objective to keep the number of shares to minimum possible number. Increased the cash allocation, trying not to hurry to invest again when cash is available. This may be good lesson from last downturn, afterall holding cash and waiting is not such a bad thing to do. I know its easier said than done!! Currently I am holding around 8.5% my total portfolio in cash. Another opportunity which came up last year mainly due to credit crunch was corporate Fixed Deposits offering high interest rates. Fund allocated a small percentage of asset by investing in Tata Motors FD & Tata Capital NCD (Non-Convertible Debenture) which offered around 11.5% - 12% interest for 3-5 years. Added 'IndexoMeter' to the site, I had written a post about importance of Index PE ratio earlier. I believe that this could be used as an indicator while making investment decisions. This is not a crystal ball, but can be used as a data point along with other informations. 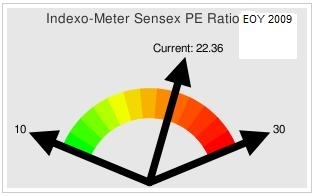 Current Index PE stands at 22.36. IndexoMeter is designed in an easy to read and understand format and I will try to update it on every weekends along with fund prices. Look for 'IndexoMeter' on top right side on the site. Stocks positions closed during the year: Portion of Reliance Petro; remaining got converted to Reliance Industries shares, SA Petrochem, Shradul Securities, Power Grid Corp, TRF, Reliance World (Radio). New stock added: None, but modified existing positions. I liquidated my US Fund on Aug/07 of 2009 for personal use. The performance from Jan/01/2009 to Aug/07/2009 was 31.44% while Index (Dow) was up 6.77%. Planning to build the portfolio again from 2010. On a personal note, I joined for MBA in 2009 Fall. Just completed my first semester (loooooong semester!! ), work and studies is keeping me busy which is why the number of posts have reduced. I hope I can find more time in the future. Again, last year was different and I consider myself lucky and next year I will have to work harder and be lucky at same time to even generate decent returns. Looking forward to a wonderful year - 2010!! Wish you all a - Very Happy New Year! !